manufacture of primary Differential Pressure flow meter devices. Dall Tubes have the lowest permanent pressure loss of any primary Differential Pressure flow element. Up to 97% of the DP generated can be recovered. Dall tubes are suitable for a number of process conditions and are particularly suited for gas transmission pipelines, where significant pressure loss is not tolerated. 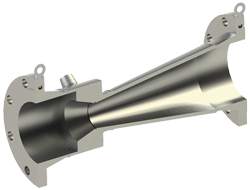 The design configuration of the Dall Tube is ideal for clean fluids. It is not suited for fluids with suspended solids. Solartron ISA offer a range of Dall Tube designs including flanged and insert types to suit various pipe-work configurations, overall length requirements, orientations and end connections. Lines size available range from 50mm up to 1200mm. We provide complete Engineering support from initial design and sizing concepts to manufactured final products.